Integrated EL34 push-pull amplifier, which can be switched on-the-fly between triode and ultra-linear. 3dB of global negative feedback is introduced in UL to maintain gain parity with triode. 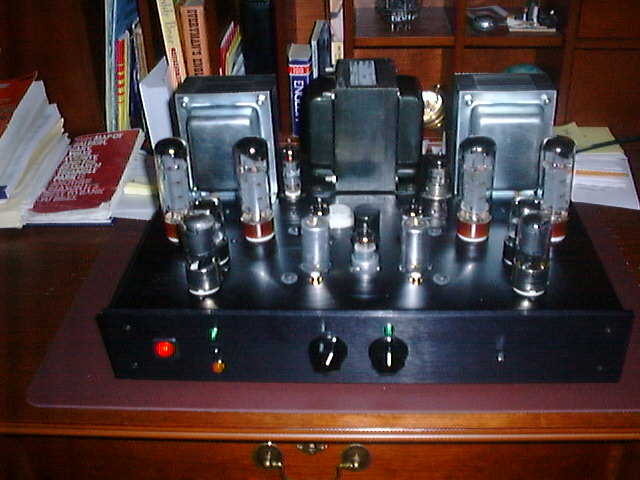 The group of tubes in the centre-front are for the phono stage. Underside view, notice that the upper is entirely power supply! A regulated power supply is used, having a hexfet as the series pass element and an EF86 pentode as the error amplifier. The power supply has a soft-start B+ delay and may be held in 'standby". I have tested the triode/UL mode with a couple of different groups and they were able to easily discriminate between the two, all preferring triode. 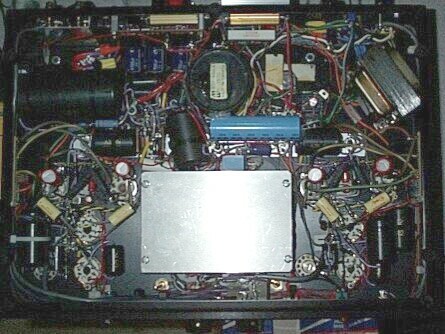 The phono-stage is on the sub-chassis which is mounted using EAR bushes. The drive circuit uses a single 6SL7 differential pair with a 6SJ7 pentode tail to ensure perfect balance. The use of a pentode results in an effective "tail" of approximately 7.7Mohm. The significance of this is that the common cathode connection can modulate the voltage of the pentode plate with almost no change in current at-all. Thus there is effectively zero signal current modulation of the pentode. 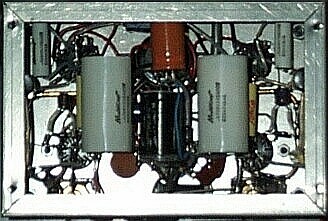 This amplifier topology has been auditioned against a superbly-executed 45 SE design (by Walter Clay of Newburyport, MA) using Altec-Lansing horns and gave away little to the 45 SE in transparency although it is perhaps slightly less dynamic and "slower" than the 45 due to the rather limited drive current available from the 6SL7. This experience debunked for me the notion that PP does not sound good with sensitive horn speakers. Furthermore, the transparency suggests that the pentode is indeed, not degrading the sonic performance of the 6SL7, merely ensuring perfect balance (within the limits of plate and succeeding grid leak resistor matching).